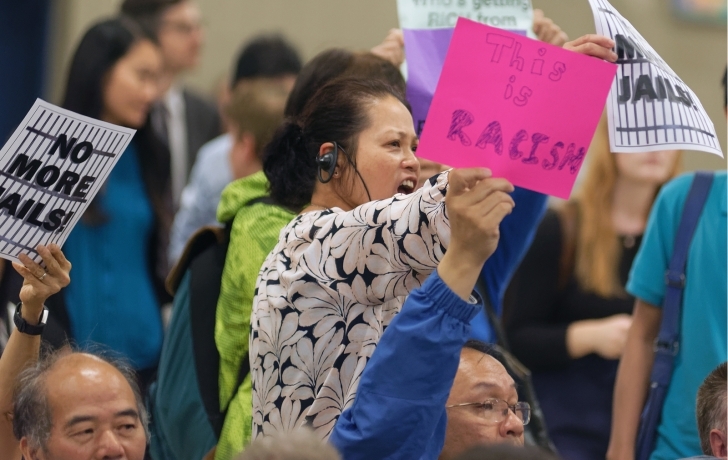 A town hall meeting on a proposed new jail at 80 Centre Street, near Chinatown, quickly descended into a shoutfest last Wednesday evening as city officials struggled to be heard above angry residents who live nearby. Representatives from the de Blasio administration were there to explain and hear comments about the mayor’s plan to convert the city-owned building into a detention center, part of a larger initiative to close Rikers Island and replace it with a jail in each borough except Staten Island. But many in the crowd of more than 300 who filled the auditorium of Chinatown’s P.S. 124 were in no mood to listen. “No jail! No Jail!” they roared, with signs raised. “Hurry up!” someone screamed, as the crowd grew impatient, wanting their turn to take the mic as the officials plowed through their PowerPoint. The meeting was sponsored by Manhattan Borough President Gale Brewer and City Councilwoman Margaret Chin who are crucial to the plan’s approval. Both voiced frustration at a process they said was moving too quickly and had not given the public a say into where the jail would go. But unlike many if not most in the audience, they stopped short of rejecting 80 Centre Street as the chosen site. Chin said people had a right to be angry. “What’s your position?” someone shouted, prompting a barrage of invectives from the crowd. Given their turn, opponents formed a long line to speak. “It will destroy the Chinatown economy,” said one. Traffic, air quality from the construction and crime were also voiced as concerns. “Why can’t a 40-story courthouse and correctional facility be put [on Rikers Island]? said another speaker. Zoning would allow 80 Centre Street, a sprawling building that straddles the Civic Center and Chinatown, to rise as high as 432 feet—more than 40 stories—and many worry about the shadow it would cast across Baxter Street on Columbus Park. “The trees will suffer, the plants will die and the community will die with them,” said Joe Mirabella, a Chatham Towers board member. One speaker compared de Blasio’s plan to put the new jail near Chinatown to his decision to scrap the specialized high school admissions test, penalizing Chinese-American students who disproportionately excel on the exam. And when another speaker called de Blasio “racist against Chinese,” Deputy Borough President Matthew Washington, who is black, stepped in to disagree. “I don’t work for the mayor, but I don’t think he’s a racist,” Washington said. “You’re not Chinese!” someone called out. Kaplan promised that local concerns would be studied. “We have heard that there are a number of community considerations and we are currently conducting analyses, looking at minimizing the effect to local traffic conditions, reducing [Department of Corrections] staff parking, minimizing the shadows cast on Columbus Park, and ensuring that the new facility does not have a negative effect on the pedestrian experience.” The results of those studies are expected to be made public for comment in December. A public hearing on the draft scope of an environmental review of the project will be held Sept. 27 at 6 p.m. at the Manhattan Borough President’s office, 1 Centre St., 19th floor.